GOES-R launched on November 19, 2016 and along with GOES-S (2018) will extend the availability of the operational GOES satellite system through 2036. When the GOES-R satellite reached geostationary orbit on November 29, 2016, it was renamed GOES-16. On May 25, 2017, NOAA announced GOES-16’s operational location as GOES-East. The GOES-East position was chosen primarily because it offers full coverage of the continental United States and provides optimal viewing of the states and cities in the Plains, Midwest and East most impacted by severe weather events including Atlantic Hurricanes, thunderstorms and tornadoes, major winter storms, and flooding. GOES-16 began drifting to the GOES-East operational location of 75.2 degrees west longitude on November 30, 2017. Drift was complete on December 11, 2017, and nominal operations resumed on December 18, 2017 when the satellite was declared GOES-East. The old GOES-East (GOES-13) continued to produce products distributed through GOES-14 (Standby) from December 7, 2017 until it turned off on January 8, 2018. 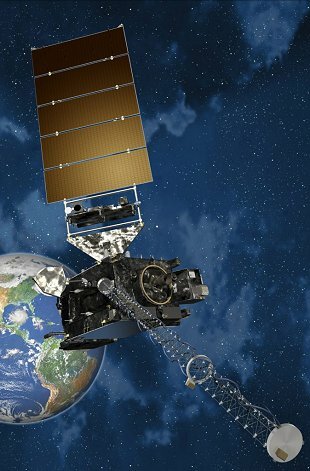 GOES-S was launched March 1, 2018. GOES-17 began drifting to its GOES-West operational location of 137.2 degrees west longitude on October 24, 2018. Drift was completed on November 13, 2018 and nominal operations resumed on November 15, 2018. The satellite will be declared GOES-West during the week of February 11, 2019. The change from 137.0 to 137.2 has been made for operational efficiency and to minimize impacts from other geostationary satellites.